Today is the 107th birthday of Rachel Carson. Carson was the American marine biologist and conservationist whose book Silent Spring was largely responsible for starting the global environmental movement. By observing the damage to humans and nature caused by factories and industrial agriculture, Carson presented nature as highly vulnerable to destruction by the power of synthetic chemicals. The idea that the earth is fragile, easily disrupted and unable to repair itself led to an environmental movement focused on repairing a damaged planet. This idea has had various metaphorical expressions, including “Mother Earth” as a nurturing, feminine and easily damaged entity. The notion of living harmoniously with nature took hold, inspired by images of pre-industrial peoples living close to the natural world. Underlying these conceptions is a view that, while humans can cause a great deal of damage, nature is passive and always our victim. That vision has changed dramatically thanks to the science of climate change. Today we see that the planet has been disturbed from its resting state, jolted out of the providential era of climatic stability characteristic of the last 10,000 years, and is now on a new and largely uncontrollable path that is creating conditions dangerous for human life. Clive Hamilton has written a piece for The Conversation entitled, Forget “saving the Earth”- it’s an angry beast we’ve awoken, that analyses this new perspective. a growing chorus of senior scientists refer to the Earth with metaphors such as “the wakened giant” and “the ornery beast”, a planet that is “fighting back” and seeking “revenge”, and a new era of “angry summers” and “death spirals”. Whether you consider yourself to be an environmentalist or not, the warnings from Earth system science have far-reaching implications for us all. According to Hamilton, Earth System Science is responsible for this more holistic view. The rise of Earth system science – which has brought together many different fields of science so that we can better understand how the Earth’s atmosphere, oceans, land and other systems work together – has changed the way we see the world. Now, the Earth is understood as a dynamic system with strong feedback effects, which can suddenly shift it to a new state when critical points are crossed. So profound has been the influence of humans that scientists have proposed that the Earth has entered a new geological epoch, the Anthropocene or the Age of Humans, defined by the fact that the “human imprint on the global environment has now become so large and active that it rivals some of the great forces of Nature in its impact on the functioning of the Earth system”. At some point, we graduated from adapting to our environment to making it adapt to us … But now we regularly decelerate and accelerate natural processes, focus energy in extraordinary ways and alter, destroy or create ecosystems. That means we must no longer see the Earth as the submissive repository for supplying our resources or taking our wastes, nor as the docile victim of our rapacity or carelessness. The palaeoclimate record shouts out to us that, far from being self-stabilizing, the Earth’s climate system is an ornery beast which overreacts even to small nudges. 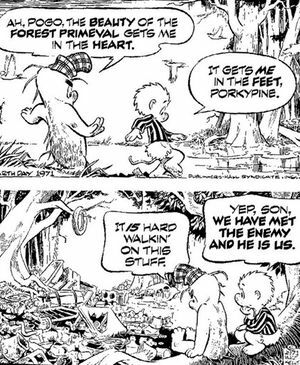 When the Earth is understood this way, the task of environmentalism can no longer be to “save” or preserve the planet, for the planet we wanted to save has already become something else. Our task now is to do what we can to pacify, or at least not aggravate further, something vastly more powerful than we are. If we have wakened the slumbering beast by poking and prodding it, the prudent course is firstly to stop. But we cannot put it back to sleep. There is no return to the peaceful conditions of the Holocene, at least not for thousands of years; but to provoke it further, as we still are, is foolishness on an epic scale. So, the metaphor of “Mother Earth” is being replaced by something akin to William Butler Yeats‘ rough beast slouching towards Bethlehem. The economy gained 236,000 jobs in February, well above what had been expected, while the unemployment rate fell to 7.7 percent, its lowest level since December 2008. Total nonfarm payroll employment increased by 236,000 in February, with job gains in professional and business services, construction, and health care. Professional and business services added 73,000 jobs in February; employment in the industry had changed little (+16,000) in January. In February, employment in administrative and support services, which includes employment services and services to buildings, rose by 44,000. Accounting and bookkeeping services added 11,000 jobs, and growth continued in computer systems design and in management and technical consulting services. In February, employment in construction increased by 48,000. Since September, construction employment has risen by 151,000. In February, job growth occurred in specialty trade contractors, with this gain about equally split between residential (+17,000) and nonresidential specialty trade contractors (+15,000). Nonresidential building construction also added jobs (+6,000). The health care industry continued to add jobs in February (+32,000). Within health care, there was a job gain of 14,000 in ambulatory health care services, which includes doctors’ offices and outpatient care centers. Employment also increased over the month in nursing and residential care facilities (+9,000) and hospitals (+9,000). Employment in the information industry increased over the month (+20,000), lifted by a large job gain in the motion picture and sound recording industry. Employment continued to trend up in retail trade in February (+24,000). Retail trade has added 252,000 jobs over the past 12 months. Employment also continued to trend up over the month in food services and drinking places and in wholesale trade. Employment in other major industries showed little change over the month. The numbers would have been even better if not for the continuing cuts in public sector jobs. Public-sector employment continued to shrink, however, as the number of government employees nationwide fell by 10,000. Unfortunately, something else has gone up at an unprecedented rate, average global temperature. Unlike it’s obsession with business numbers, the main stream media doesn’t seem to be overly concerned with this much scarier statistic. 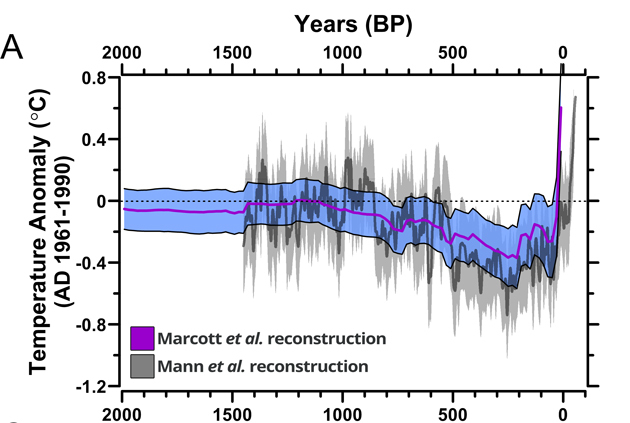 According to Tim McDonnell, the real concern is not just that the average global temperature is higher than any time in the last 11,300 years; it is the amazing current rate of change. There are certain photographs that become iconic. They engender an immediate connection with an event, tragic or triumphant. They put the event in human terms, often showing a family, as in Dorothea Lang’s iconic photograph of Florence Owens Thompson and her children. 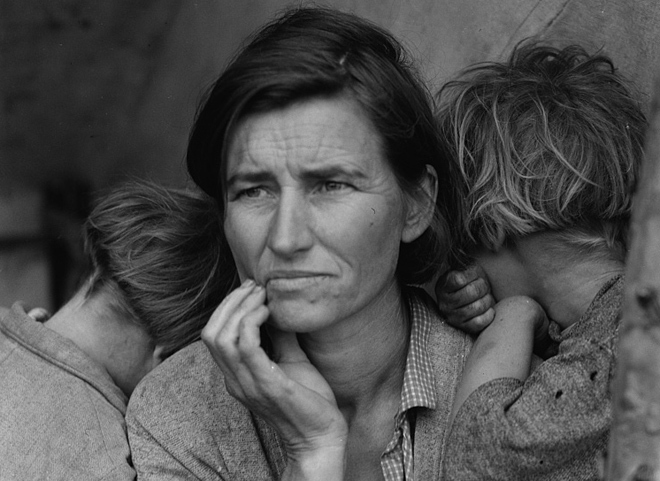 The photo became the most famous image of the Great Depression in the United States. It has become an iconic image of resilience in the face of adversity. See here for a list of 27 photos that also fit the description. Perhaps the most famous compilation is Life Magazine’s 100 photographs that changed the world. I started thinking about other events or phenomena that might engender an iconic image for future generations. Climate change is just such a phenomena. 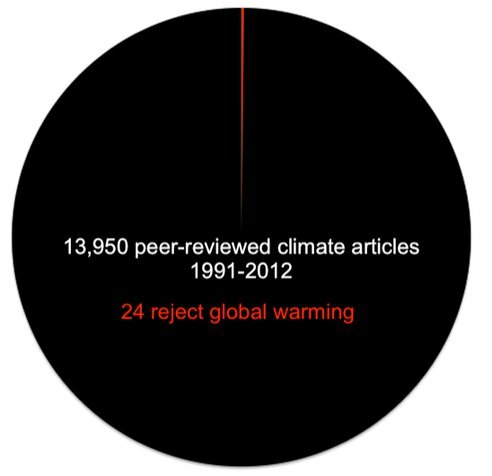 We appear to be at the point, finally, where it is generally understood that a scientific consensus has been reached identifying human activity as the major cause of climate change. James Lawrence Powell did a meta-study of almost 14,000 peer reviewed scientific papers written from 1991 to November 2012. His pie-chart says it all. Of course, there are still morons like Henry Paine of National Review who, as part of the “manufactured doubt” industry, intentionally confuse climate with weather, but when, in his inaugural address, President Obama called for America to lead the world’s response to the threat of climate change, it became clear that it is time to find an iconic image worthy of Dorothea Lang. 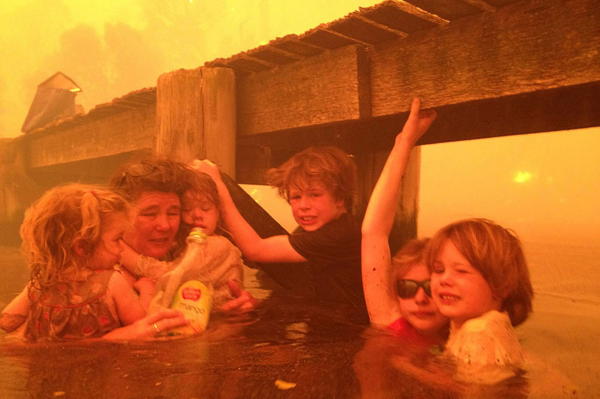 I am sure there are hundreds of photographs that could serve, but, for me, the first image that came to mind was of the Holmes family huddled in the water as the Tasmanian wildfire raged around them. I feel that this picture has that same emotional impact as Lange’s photograph. It depicts a family, in this case a grandmother and her grandchildren, clinging to each other- resilience in the face of adversity. What I find most amazing is that, unlike the posed Lang photograph, this picture was taken by the children’s grandfather in real time. Here is how the UK’s Guardian newspaper described the photo.